This is the (non-photoshopped) face of truck driver William McElligott, which was published in The New England Journal of Medicine. He has been a truck driver for 28 years, exposing the left side of his face to UVA rays which can penetrate glass windows. 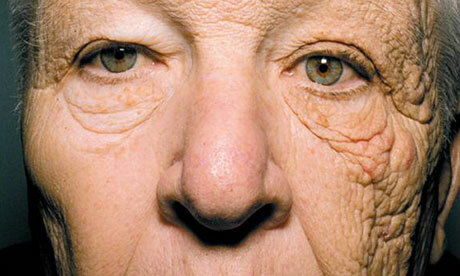 The asymmetry of his face demonstrates the damaging effect of the sun. Concerning? I'd say so. While you're grabbing the sunscreen, throw on a hat too. I know, right? It's called Unilateral Dermatoheliosis. Luckily, he tested negative for skin cancer, but he is being monitored with regular screenings. Hey there, I didn't know you had a blog. I've actually seen the effects of this among pilots. I know an AF major that wears sunscreen and his face is literally a baby-face. He looks like a dude in his early 20's. I actually try to put on sunscreen everyday now because of him (that was what he told me he did). That's a fantastic example! Glad it got you to take care of your skin. I'm sure there's lots of UV exposure when you're flying all day at high altitudes. Hi Charlotte, I think that this example is a bit "extreme". Sun exposure can be beneficial, (it boosts our vitamin D production), we should just not abuse it. Also, most sunscreens contain harmful ingredients that have way worse effects on our health than sun exposure. Yep! It's so important to take care of your skin. It's our largest organ afterall!